As anyone with a faultless memory will recall, twelve weeks back saw us visit The Spa: we'd intended to alight for lunch at today's venue only to find it closed. Though, to our credit, we did indeed find it, which ain't that easy. Locals will know that the nearest entrance by road (see map) is opposite the Bartlet(t) Hospital. Is that one T or two? Even the BBC website isn't sure. Any Undercliff Road up. Made it, at last, to the Cliff Top Tea Rooms. Through the door and you'll find what appears to be a hotel dining room, albeit one with a NAAFI-style serving area. 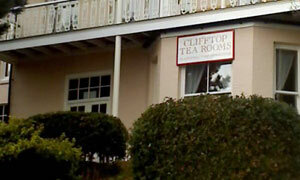 Helps to know that the Clifftop Tearooms, as their business card has it, occupy Cliff House, once an annexe for the grand Cotman-designed Felix Hotel (now remodelled as Harvest House). Sign on the wall says "Counter Service", so we secured a table, chose our grub and ordered. Bags of time to admire (a) the for-sale paintings adorning the wall and (b) the impressive garden stroke sea views, rivalling The Spa and Mrs Simpson's. Seems like we'd turned up at the tail end of the lunchtime rush, and joined the end of a long queue. Could have eaten a seahorse by the time our food arrived. Thankfully my large plate of two eggs & sausage & saute pots & bacon & fried bread & toms & toast & beans was worth it, and arguably the best all day breakfast yet. G's fish pie floated his boat too. Tock ticking along but we demand pudd. One of the old-fashioned desserts caught G's old-fashioned eye, the apple & raspberry crumble with custard, ideal for a wintry day. My individual cafetiere would have been far too wet without cakestuff, hence my brick of chocolate biscuit cake. Had I been out with the kids, we'd have shared it and all had ample. As it was, I scoffed the lot. And so, despite the near-freezing climate, I was grateful to gulp down some oxygen outside. If it was a car -- Bristol Blenheim 3. If they were passing by -- Connie Booth.